Are you going through a mid-life crisis? Click here to play! Well, rather than spend all of your money on beautiful women, hot tubs, adventures and fast cars, you can earn money in Mid-Life Crisis and still get all of the abovementioned treats! Go through your Mid-Life Crisis and win, win win! The first thing one must have when going through a mid-life crisis is a fast car. If you can spin five of the little red convertibles in this game, you'll win the progressive jackpot and have enough money to buy a real one! Spin five yachts and you'll get up to 3200 coins. A clip full of money is worth a whole lot of money, with five of these symbols paying out up to 2000 coins! There are plenty of other symbols to get you through your Mid-Life Crisis, including motorcycles, little blue pills, skydivers and hot tubs. 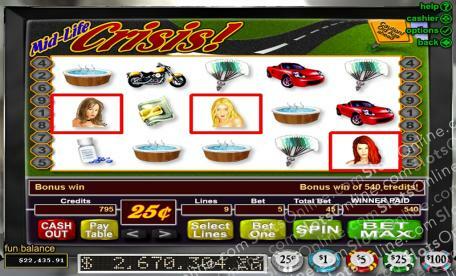 The best part about this crisis is that you can trigger bonus features and be rewarded cash prizes! The Lovely Ladies and the Mid Life Man both trigger their own features. Rather then spending a lot of money on your mid-life crisis, play now and make a lot of money! The Mid Life Man acts as a scatter symbol. If you can manage to get all three components of the Mid Life Man from left to right, you'll get a cash bonus. If you get three Lovely Ladies, you'll trigger the Pick You Poisen Bonus Round. During this game, you'll pick an adventure to go on. If you select a winning adventure, you'll win a multiple of your original bet. If you get Krazy Al's Miracle Youth Tonig, can win a multiple of your original bet.